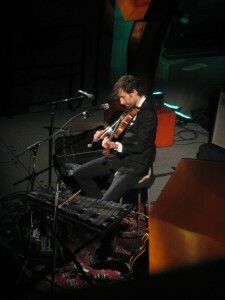 Andrew Bird took the stage Monday night in a sober black suit, a far cry from the blue dinner jacket and plaid shirt he’s been going around in all fall. More interesting, though, was the fact that he awkwardly limped across the stage; Bird said that he injured his foot the other day in Minneapolis, and has had to do his shows sitting down because of it. Not one to let an injury stop him, though, Bird soldiered on (pun slightly intended) and delivered a unique set of music on a somewhat chilly winter’s night. I’m holding off on my full review until all four shows are over — because really, I’ll just wind up writing the same thing each night. Suffice it to say, though, that if you can somehow get in to one of these shows, do it.